One very common cause for Monday blues is that sometimes we get so busy during the week that we end up piling up tasks, appointments and things to do, all weekend long, leaving little to no time to sit back and relax. Result? Monday morning knocks on our door to pick us up, but we’re still having dinner with the previous week’s (or weeks’) stress! For many years I struggled to find the right balance between work and my personal life, and Monday blues have always been the alarm bell indicating that something needed to change. 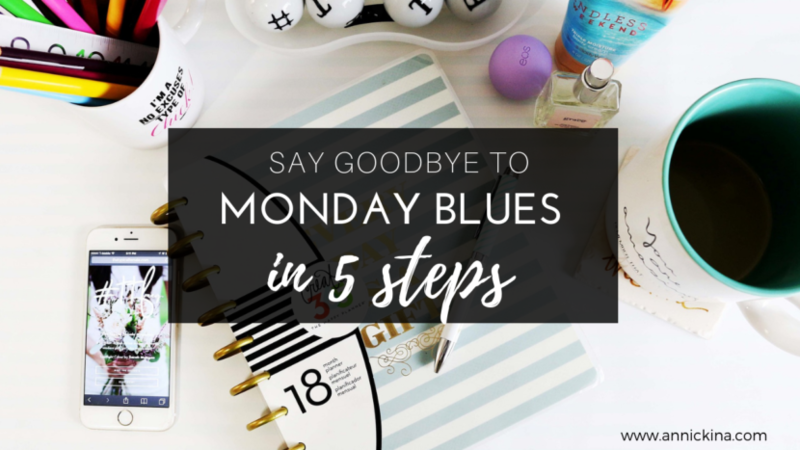 Here are 5 steps to get you ready and chirpy to answer the door next time Monday morning shows up! Setting your intention for the day when you wake up is like choosing the soundtrack for your day: is it going to be a light and happy one, a classical piece that leaves a trail of relaxed vibes, or a scary horror movie theme song? Today I will make the most of what I have. And really commit to this. If something bad happens, focus on finding a solution rather than losing it on why it happened. Today I will be my best self. Committing to giving it your best shot comes with a bonus: not only will you be performing better than usual, but also, if things go wrong, you won´t beat yourself up. You will be compassionate and forgiving instead, because you’ll know that you’ve tried your best. If you make a mistake, it´s OK: you will have another day tomorrow to make things better, be your best self again and make the most of what you have. Another reason why I like this affirmation is that as you make an effort to be the best version of you possible, you will also try not to give in to anger, resentment or any kind of conflict with your colleagues, co-workers, or in your relationships. Believe me, you won’t have to wait long to reap benefits from this. Halfway through the morning, take a break and have a cup of tea or coffee (preferably tea!). Take a minute to breathe. Close your eyes and observe your body. See if there’s any tension anywhere, any part that requires attention. Feel what your body really wants, what could make it happy, and commit to doing that after work. It could be a warm bath with essential oils, a slice of cake from that amazing gourmet shop around the corner, a delicious sushi dinner, or anything that will make you feel GOOD. The thought of a treat waiting for you at the end of the day will definitely give a new perspective to your day. Lunch is important, not only because you are going to give your body food, and therefore energy to go on for the rest of the day, but also because you’re going to create a break and have your brain and body relax before tackling the second half of the day. So, when having lunch, if possible choose something good to eat, but whatever it is that you’re having, try to include some gratitude in your eating process. This is an exercise that I’ve learned from my health and wellness coach, Gursharn Rae, and it adds a whole new dimension to your lunch experience, however short or however sh*tty the food you’re eating! Here’s how to do that: Let’s say you’re having a salad. Or actually, let’s go for something more challenging. Let’s say you don’t have much time, and you’re having a hot dog. Your hot dog is made up of bread and sausage. As you take a bite of it, take a moment to think about what it’s made of. For example, there’s bread, so think about the wheat that was used to make that bread, the water, the yeast, the people who made that bread, and be thankful. It didn’t just grow on a tree! It went through different steps before it came to your hands, so take the time to really appreciate that and be grateful. As you leave work, make sure you act on that reward you’ve chosen for yourself earlier. Some of you might still have domestic duties, children, a dog or a cat to attend to, stuff to do once they get home, but make sure you keep at least HALF an hour to FULLY relax and indulge in some self-care. You’ve spent a long part of the day working, so you need to put your feet up and recharge your batteries. Also remember to fill your energy tank: make sure you have a healthy balanced meal for dinner. Try to make it not too late so that by the time you go to bed, your digestion will have been completed. Step 5: Switch off and do your thing! Put your electronic devices away at least half an hour before going to sleep. It’s been scientifically proven that the light from your computer, TV or cell phone has a negative impact on the quality of sleep, so put everything away (or even better: switch everything off!) at least half an hour before closing your eyes. If possible, create a short ritual that will let your brain know that it’s time to slow down. It could be washing you face and hands and putting on a soft night cream, or reading a passage from your favourite book. My favourite ritual before going to bed is a short breathing exercise and reciting my evening prayer, inviting the “cleaning lady” to step in and get rid of any thoughts or feelings that don´t serve me anymore, leaving my body clean and fresh to start a new day in the morning. So this is it. Wash, rinse, repeat. Start doing this and you will soon see the difference in your life. When you create the right balance, life shifts from tiresome to awesome. I’d love to hear about your experience. What’s your favourite step? What is the most challenging one? Please share in the comments! If you know someone who needs some re-balancing in their life (we all do! ), do them a favour and share this article with them, you’ll be getting good karma for that!